My client wants to publish on your blog for $100 per post! 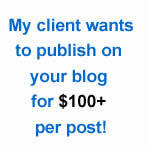 →My client wants to publish on your blog for $100 per post! Please Note: This is another opportunity to be paid $100+ per post you accept on your blog! Some few days back, I posted this opportunity from a client who accepts guest articles on his blog for $100 flat. That means you send him your guest post and if you meet his requirements, he pays you $100. This time around, it’s another opportunity that requires less from your end. The client in question wants to send to you top quality articles, written in pure English. All you have to do is publish the articles on your blog and get paid per article. In my private conversation with my client, after having published on this blog and a few others I recommended (they were all paid $100 per post), he now asked me to recommend some more blogs. I suggested to him to make this as a public announcement on this blog so my readers can all benefit. I’m excited he permitted me to make this post. So here is the deal …. How much will he pay you? You may be paid $50, $100 or even more. Yes you can be rewarded handsomely if you help my client gain exposure. Remember, my client and his team do the writing in perfect English. They may also provide images or require you to come up with some. Here are a few things to get ready! You understand that you have to get some elements ready as proof of popularity. For a start, we require you send to us the PDF report of your Google Analytics. Follow these steps to generate the report. 2) Click Acquisition -> All Traffic -> Source/Medium as shown by the image above. 3) Be sure to pick a date range that covers the past 30 days. See image below. Make sure you click “Apply” to load data for the selected period. You will have to send an email to the client with your Google Analytics pdf report attached. I just require a Tweet/Facebook Share from you to access the client’s email. While you tweet or share to give this post a lift, you will be helping your community and friends know about the opportunity. So what do you think about this opportunity? It was a great opportunity, but it seems I was not ready to take this opportunity. That’s a pity. Thanks for sharing, Enstine. Have a great week ahead! Another great opportunity! thanks for the share Enstine, this is indeed great information and a hear steamer for any blogger. Lets me run up to him. Money Money Money, you’ll hardly see anyone who would not read this post “smile”. I just woke up and heard the mail pop up from my phone. This is indeed a wonderful opportunity for some people to make their first $100 online or in blogging. I was actually telling some of my readers that it’s is not only by ad sense one can make money, you can also make money with your passion. Another thing i’m gonna point out here is ; now we”ll know those who are serious with their blogs. Thanks enstine with this wonderful and great offer. Am sending mine right away. Thanks for sharing another great opportunity for us to make money blogging – and especially for the detailed instructions for getting hold of the PDF. Good one Enstine… Actually i am really warming up and loading up my gun to get back into the internet marketing and make money online blogging niche and my new blog is almost complete. I don’t think i would be able to meet up with this offer but when next something like this comes up will be glad to glad to send over details from over here too. You always find the best opportunities! This is a good one that I myself have to take advantage of. I’ll make some time Monday or Tuesday to come back to this post and send my information! Thanks for sharing this opportunity! Quite an interesting offer made by your client. It’s even bigger since you have gone out of your way to publish it gwrw on your blog. Congratulations to whoever that lucky winner/s may be. Thanks for bringing the offer to your readers. This is exciting. Glad to hear see 100$ from guest post. I am lucky that i have a blog that have all the topics you mentioned to get 100$ guest post.. Just have to increased social presence and traffic. Such a wonderful offer you came up once again. Going to submit my weblog too and lets see either it will accept or not. Thanks bro for your nice gesture and always came up to help other bloggers. Thanks once again, have a nice Sunday. Thanks again, have a very relaxing sunday! I love coming to your website. Everytime I come to know something new, any new tips and tricks, money making opportunities and so on. Thanks a lot for sharing opportunity, will help us and lots of other bloggers to earn money. Yet another great opportunity to make money via blogging shared by you. This is really a cool share. Hello Enstine, I like your blog very much as every time I lands on your blog, it learns me some new things. This time too it’s is offering a great opportunity. I just want to know that how much traffic is suitable to get paid. You are really doing great here. This is wonderful opportunity for every bloggers. Let’s see who will be accepted and who will not. Tell Me If You Can Help Me With This. I Want To Make my Blog Famous Been Blogging From Much Long. It Will Be great If You Will Help Me. I Don’t Whether My Reports Will Be Considered or Not But Then Also I Will Try. Hey Muki been again here! Well this time I was surprised to see a 100$ deal but I don’t think I could apply this time may be a little later on such deal. Overall what i get to know being on this post that you don’t just need adsense to get that number in your pocket you all need is quality over quantity. And off course a smart work to drive out the desired result. Hey Bro! Its great to see here that i am not the only one who is not going apply this for his blog. Well i know its really sad but still i’d love to suggest you that refer this thing to your friends being a mediator. Even if you make 5$ from it, its more than nothing right? However, why are you too not in? Well thank bro! Btw how will i share and get 5$ lol. Do tell me I’ll be waiting! any way why aren’t you applying? Hey why are you backing out? hEY! i’M BACKING out because my blog is quite new and doesn’t comply with the mentioned list and I know there are a lot more blogger who will beat the competition before I’ll apply! This is just like a golden opportunity but my blog doesn’t meet the above mentioned requirements but ya i will share it with my fellow bloggers whose blogs are perfect. Thanks a lot Enstine for this post and now heading on towards clients email. This is great to know that you are giving us an opportunity to earn $100 only by publishing article on our blog. I just sent the mail with all attachment. So this week regular follower of your blog can make up to $200 if he follows your suggestions carefully. This is the biggest value you are offering to your blog visitors and a step ahead of simply giving suggestions and tips as being done widely in blogosphere. Thanks a lot for sharing yet another generous offer. Waiting for the third one 🙂 as DO MORE is the popular mantra in blogging. Mi Muba recently posted…How to avoid cyber bullying and keep blogging successfully? So good to see you here and thanks for reading, signing up to my list and dropping a comment. I’m so impressed and hope we stick to each other. Are these paid guest posts still work? I am not sure if there is any good advantage, unless the blog is super authoritative. also, if there are too many guests posts on the blog, with frequent rate, it will give most likely negative impact on the link juice. 100$ per post 😮 sounds huge ! great post will give it a shot when time permits me and leave a comment regarding them here again 😀 ! really 100$ per post is damn huge 😀 ! must try them out !!! Thank you very much for letting me know about this opportunity about some of your clients needing blogs to host their guest posts on. I really appreciate it because I have been needing some extra income lately to pay my doctor bills and electric bills and house bills. And I really need some extra income and if your clients would accept my website entitled ( Money and Technology.com ) that would really help me out a lot to pay for my bills. I will send you my website Google Analytics report by email. It’s really a wonderful post and you have shared a very good opportunity on your blog. I have sent you a mail along with source/medium report in PDF format. Fantastic opportunity to every internet user who maintains a quality blog for 4 figure income. Thanks for this awesome post, am really interested to earn online. Hope this will help me a lot further. Thanks for sharing this. Definitely sounds interesting and I will be sending it over by next week Monday or tomorrow, Sunday — earliest. Keep you informed and cheers! This is a great opportunity for us to get a quality post for our blog and even get paid for it that is getting a sponsored post without making effort of finding any . Thanks for giving your readers this opportunity. Would like to know that till when is this opportunity available as I am not able to use net on my lappy which will take some time . Ok I will try my best to access it as soon as possible but my net speed is too slow and a cafe is too far from here . Great Opportunity Mr. Enstine! This is one of the main reasons I love your blog, You are very Open Hearted not Only to teach us, but also to Give us Tangible stuff we can always remember you for. Thanks for this, I have sent my Analytics, Hope I am qualified for the Offer. Thanks for the beautiful comment. Woww Esntine! What an opportunity. Just that i blog on lifestyle / Mental Health. Will definitely do if window for mine opens in future. Thanks for the Info. Thanks for leaving a feedback. I’m sure to have another opportunity in the near future. Yet another great update from Enstine, Am fit with all requirements but don’t know if I would be considered with my Google analytics record. It’s time to get the report and contact the client. Thanks for sharing such an opportunity for us to make $100 just for publishing the post. I had submitted my report to the mail you have shared with us. Hope to get positive response. Hey Suprabhat! Its great to you here, and actually very nice question asked by you. Yes Enstine do give us some tips on how to get positive response? Maybe in your next post?